A sandwich is made when two pieces of bread are surrounded by meat and/or cheese to form a delightful meal. National Sandwich Day is made when chains across America give you free food in order to celebrate a completely made-up holiday. And guess what? That day is today! We've got deals from Arby's, Potbelly, Burger King, Schlotzsky's, and Capriotti's. So go out there and get you some free sandwiches before the day's over! The deal: Buy any drink and fill out this simple form so Arby's can send you promotional emails, and the chain will hook you up with a free Roast Beef Classic. When: Today, Nov 3rd, but also any day you feel like filling out that form. The deal: You're likely reading this on your phone, so this one is easy. Download BK's app and you get a free Whopper when you buy one. That's a Whopper of a deal. Sorry. When: Today, Nov 3rd, but also any day you feel like downloading that app. 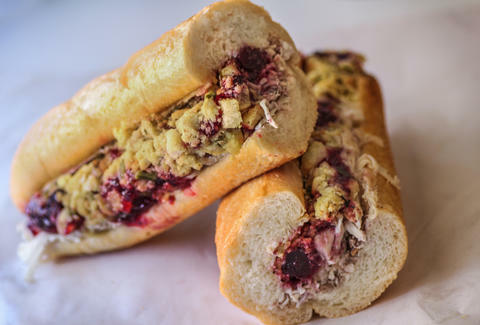 The deal: You don't actually have to buy anything to enter the contest to win free 9in subs for a year (you can just mail in an entry to an address listed here), but it's more fun to go to a Capriotti's today, order a sandwich that's at least $4.99 (get a Bobbie if you know what's good for you), download its CAPAddicts Rewards app, and scan in your order. Who knows, you might get free subs out of it! The deal: Use your skills on the 'gram to take a picture of your lunch at Potbelly today, tag it with #NationalSandwichDay, #PBEntry, and @PotbellySandwichShop, and if you get the most likes after 24 hours, you'll win a $500 gift card to the fast-growing sandwich chain. Second and third place winners get free food too. The deal: Most other sandwich chains make you download an app or sign up for something, but Schlotzsky's deal is as simple as it gets: buy one medium sandwich and get one free. If that doesn't make you hungry, maybe our list of the 50 best sandwiches will help. Lee Breslouer is a senior writer for Thrillist, and is having a sandwich for lunch. Follow him to sourdough bread: @LeeBreslouer.